Anointed Fighter BCAA with 30 servings. In every serving, provides a 10 gram blend of the three critical Branched Chain Amino Acids (L-Leucine, L-Isoleucine and L-Valine). 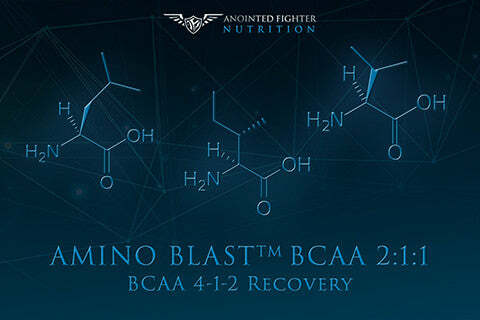 Branched Chain Amino Acids (BCAA’s) are essential for the body, and help repair muscles and decrease muscle soreness. 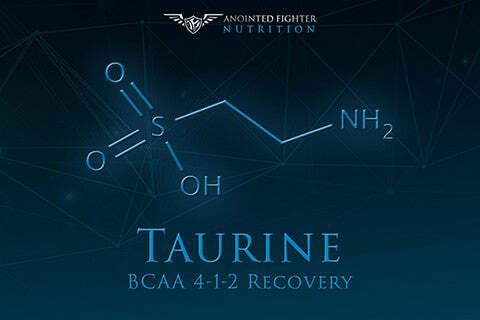 BCAA 4-1-2 Recovery takes BCAA’s to the next level by adding Taurine and Beta Alanine. Taurine promotes greater muscle strength and endurance; it also helps the body metabolize fat. 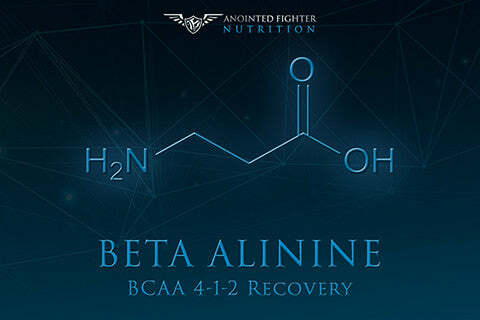 Beta-Alanine promotes muscle strength as well as reduces fatigue. In each scoop, BCAA 4-1-2 Recovery prevents muscle breakdown and helps builds lean muscle. 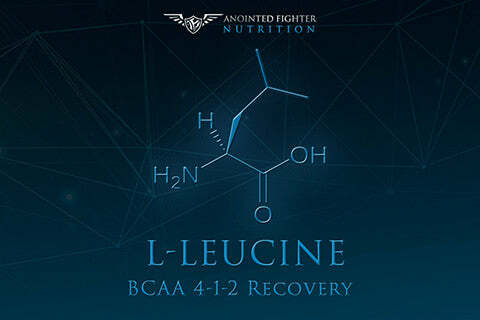 An essential amino acid found in BCAA compounds, L-leucine is found in foods such as meat or dairy, as well in supplemental form. L-leucine promotes weight loss and inhibits muscle protein breakdown. This amino acid has also been shown decrease body fat levels while simultaneously improving levels of good cholesterol, or lipoprotein, in the blood. 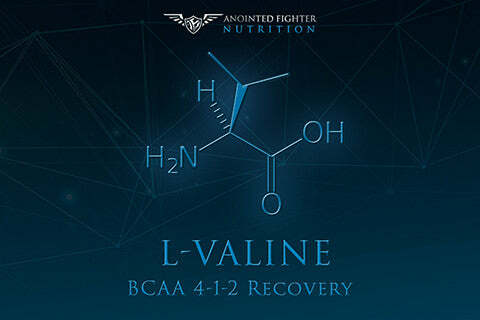 An essential amino acid found in BCAA compounds, L-valine is found in foods such as dairy, lentils or fungi, as well as in supplemental form. L-valine promotes muscle growth and inhibits muscle protein breakdown during strenuous exercise, by supplying much needed glucose to the muscle tissue for an extra boost of energy. This amino acid has also been shown to promote a healthy immune system, minimize stress levels, suppress appetite, and remove toxins such as excess nitrogen. The only beta-alanine supplement licensed by NAI global as a human dietary supplement, CarnoSyn® is the leading ingredient in sports nutrition formulas. Supporting an increase in muscle carnosine, CarnoSyn® has been shown to increase athletic performance over the last decade. With a bio-friendly beta-alanine formula, CarnoSyn® delivers an increase in the naturally occurring beta amino acid essential for muscular carnosine synthesis, delaying muscle fatigue and failure. With CarnoSyn® beta-alanine, athletes and active adults benefit from decreased fatigue and muscle burn, while maximizing workout results. With evidence supporting a connection between long life and the amino acid, supplemental taurine has been shown to promote electrolyte balance, hearing function, cardiovascular health and a healthy immune system. Found naturally in certain foods as well as naturally occurring in your own body, Taurine is considered one of the most essential compounds for a healthy lifestyle. Studies show that Taurine is helpful in reducing overall triglycerides, improving glucose tolerance and increasing endurance - while reducing the lactic acid build up of muscles. A natural, safe and popular supplement, Taurine will help your muscles work harder and longer, protecting them from damage and overexertion.